I’m so pleased to introduce you to Kristin, of Skirt as Top, who is guest posting for us today! 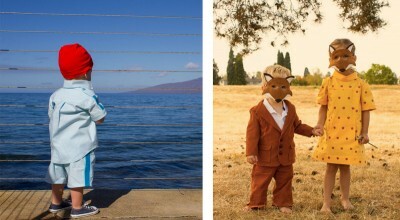 Kristin is the creative genius behind some of my favorite Oliver + S outfits in the Flickr group, like the Steve Zisou and Fantastic Mr. Fox. She has impeccable taste in fabric and an enviable eye for detail. Kristin started sewing in 2009, when her daughter was a toddler. As she shopped for clothes for her to wear, she quickly discovered her taste was very specific, and she wasn’t finding what she wanted in stores (affordably, at least). When they were growing up, Kristin’s mom had sewn lots of clothes for Kristin and her sisters, so Kristin had learned enough about sewing that it wasn’t totally unfamiliar, but she still had a lot of learning to do. She asked for a sewing machine as a Mother’s Day gift from her husband, and started to search online for ways to learn sewing. She was so new to it, though, she didn’t want to invest a lot of money in patterns right away. The first pattern she discovered and sewed was the free Lazy Days Skirt. Her first pattern with pieces was the free Popover Sundress. She’s now sewed with several different Oliver + S patterns. Kristin’s daughter is now 4 1/2, and her son is nearly 2. She works at an office job four days a week, sewing and blogging mostly when her kids are asleep (they’re good sleepers). She makes time for sewing and blogging because it’s a rewarding craft and one she feels very passionate about. She has been blogging at Skirt as Top since March 2011. Hello, I’m Kristin and I’m beyond excited to be here posting on the Oliver + S blog today! When Liesl asked me to do a guest post, I had a few ideas swirling through my head of what I might want to talk about, but after seeing all the inspiration pop up during Elsie Marley’s Fall Kids Clothes Week Challenge last week, I knew I needed to post about the Oliver + S patterns that say “fall” to me! I’ve rounded up a bunch of my past projects and mixed in some favorites from the Flickr group, too. 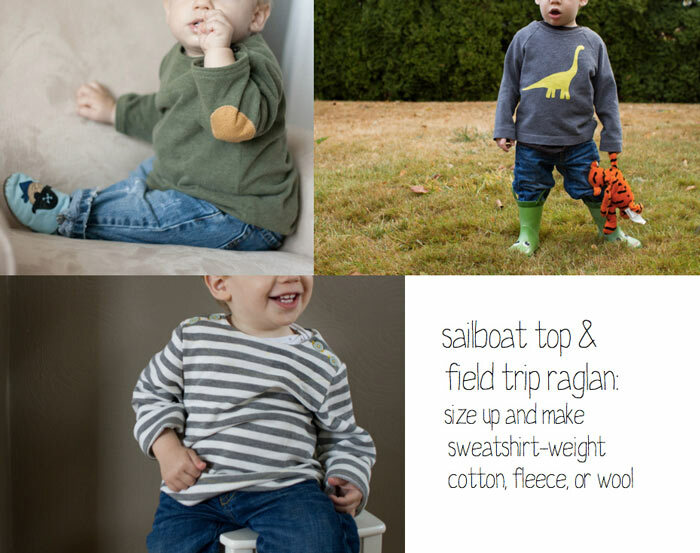 Check them out and please let us know in the comments if you have any other favorite fall patterns or ideas to take more summery Oliver + S patterns into fall! First up, by using sweatshirt material, fleece, or wool, the Sailboat Top and Field Trip Raglan Shirt are suddenly great cozy sweaters, perfect for layering! Might want to size up to account for a shirt underneath. I love to use my husband’s old sweaters for these and add details like bright topstitching, elbow patches, or appliqué to give them a special touch. Another way to use material choice to convert a “not so fallish” pattern is by using corduroy! 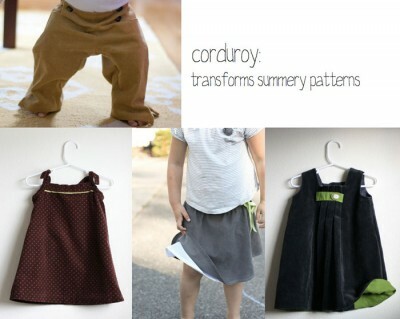 Add a few inches to the Sailboat Pants to make them full length (or make Sandbox Pants), and even summery patterns like the Popover Sundress, Swingset Skirt, and Birthday Party Dress look great in corduroy. Layer the sleeveless dresses over a long sleeve tee and pair them with tights, and your little gal is set to go for fall. Or maybe experiment with material like flannel, chambray, velveteen, or denim to expand beyond quilting cotton and add that extra texture that makes fall clothes cozy. Mittens from Little Things to Sew are less wintery when made in wool or flannel, and the Sunday Brunch Jacket looks great in velveteen. A denim Music Box Jumper and chambray Jumprope Dress are wonderful with bright accent colors. And finally, just by using color you can take pretty much any garment into fall. This could be a great solution if you live in a warmer climate and can’t bust out the velveteen without your kids roasting, but you still want to get into the spirit of the season. Green, orange, mustard, persimmon, gray, blue, cream, plum…all are lovely. Think gray skies and changing leaves. 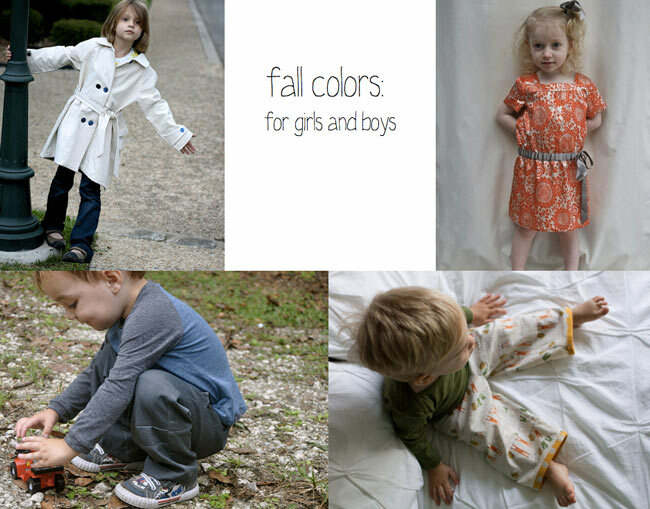 The Secret Agent Trench, Croquet Dress, Field Trip Raglan Tee and Cargo Pants, and Bedtime Story Pajamas are great patterns to use to experiment with color. I hope you’ve enjoyed this little roundup of ideas for fall! I really loved browsing back through my archives to see what jumped out at me, and the Flickr group is a constant source of inspiration (even just popping back into it as I’ve finished writing this post, I see a bunch more beautiful fall garments I wish I could include!!). Thanks so much for having me, Liesl. Happy sewing, everyone! I had no idea that all of those were from Oliver + S patterns! It’s really great to see all your creations and suggestions. Excellent post!!!! Cool ideas/examples. I’m hoping to make the Family Reunion dress in a deep purple corduroy and try out a ruched panel like Katy of No Big Dill. such fun to see kristin posting here, and i love the fall round ups! they really highlight how versatile all these patterns are! And she’s hit the big time! Congrats Kristin, such a talent. Yay!!! So glad to see Kristin here! She’s got such great talent and always put together the most amazing things! You go girl! I think Kristin may have been the one who really turned me on to O+S patterns (her and Gail from probably actually) so it’s only fitting that she posted here – she’s like a walking ad for you guys!! Anyways, love this post and all the amazing creations she’s made with your brilliant patterns. I definitely have more than a few of these on my to do list! Great roundup! I’m flattered to be included. And I absolutely adore the AMH velveteen Sunday Brunch jacket. It’s one of my very favorites. This was a really fun post to write, but so hard to narrow down the photos!!! That flickr group is insanely good. 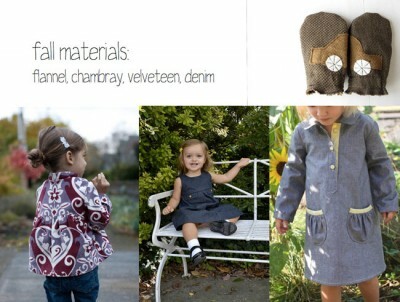 Oh, such a lovely post with great inspirations for this fall! Thank you for having my little car mittens here! Oh Kristin! What a dream! You do make the best looking Oliver + S creations around! Much love!!! I’m so glad to see you here, Kristin!!! Thanks for sharing with us your experiences and patterns.